Our advice does not end when we send out a draft contract or after negotiations have been brought to a successful conclusion. 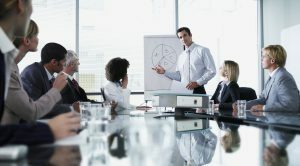 We practice knowledge transfer by providing training to the executives and employees of our clients. In-house training sessions at our client are typically less expensive and more effective than external training courses because the employees can directly interact with each other, exchange experiences and learn together. This creates true added value. We will provide you information on a regular basis about current topics in the areas of contract, labour, commercial or company law via our social media channels. In addition, we host business breakfasts in order to give you the opportunity to ask questions related to the topics discussed in our social media posts and to meet other business people. In general, the breakfasts last 90 minutes. The breakfasts are open to anyone by registering in advance on our website (in german). There is a small fee charged for the breakfast. However, the business breakfasts are of course free of charge for our clients. Are you interested having another topic addressed in-depth at a workshop? For groups of six and above we would be happy to conduct in-house training at your company. The topics and dates will be determined following consultation with you. Contact us! Telephone 0351/ 30707030 Ms Bellmann. For us, being solution-driven and practically-focused are more than buzzwords. Each of our lawyers has at least five years’ experience as in-house counsel at a tech company.